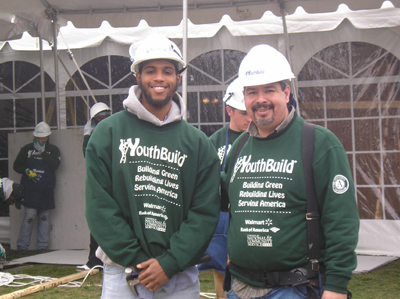 YouthBuild Philadelphia goes to Washington! 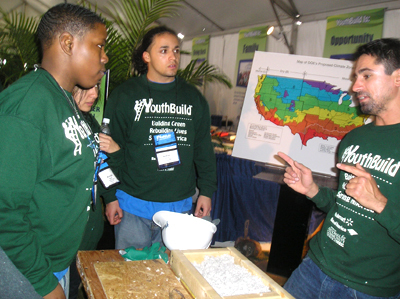 Today, YouthBuild Philadelphia led a “green” home building initiative at the National Mall in Washington, D.C. in celebration of YouthBuild USA’s 30th anniversary. Roughly 20 students and instructors joined more than 100 other young leaders from YouthBuild programs across the country, in addition to public officials and community leaders, to frame the walls of an energy-efficient, affordable home for a low-income family in Brownsville, Texas. The participants raised the walls of the house during the afternoon, after which the pieces were sent to Brownsville for completion. YouthBuild students learn the proper technique for spray foam installation. First Lady Michelle Obama keynoted in a special afternoon ceremony, commending the students on their commitment to green initiatives and community service. 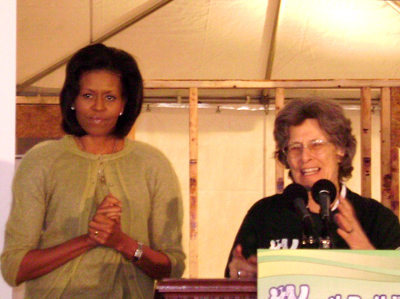 Obama was introduced by YouthBuild USA Founder and President Dorothy Stoneman. 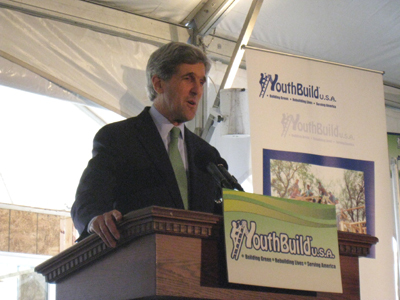 Senator John Kerry closed the ceremony, speaking about his long-time friendship with Stoneman, and reminiscing about his participation in encouraging the first federal funding support for YouthBuild. While in the District, students also participated in a “green” school, learning about green collar jobs, green schools, energy responsibility and environmental awareness. We incorporate many green practices into our rehabilitation projects, such as the installation of Energy Star Appliances and high efficiency heating systems, and the use of energy efficient insulation and windows. The March green building project exposed students to new green techniques and enhanced our stake in green initiatives in the Philadelphia community. In fact, we’ve already identified one house rehabilitation project (in the Nicetown area of Philadelphia) for the 2009-2010 program year, where our students will incorporate all green building techniques. Read more about our green building initiatives in the Philadelphia Inquirer (May 21, 2009). Previous Post Alumna writes Op-Ed in The Philadelphia Daily News!